My recent trip it Italy- the Land of Song- reminded me just how far removed we are from the beginning of bel canto singing. While the courts of Florence and Venice of the 16th century have been touted as one source of bel canto, the other lies within the church. And it is this latter branch that has largely been forgotten. What brought this thought to mind? Singing chant in three beautiful spaces. 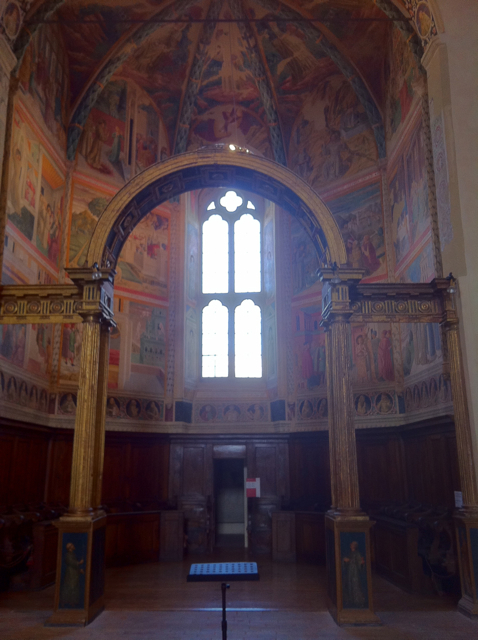 The last one especially, the San Francesco Church Museum in Norcia, had an acoustic that was at once elevating and clarifying. You could hear the top of the pitch when singing as well as the core of the tone. The tone shimmered on gossamer wings. In pedagogical terms, what I heard was 'head tone'. You can't sing chant any other way really, that is, if you are singing chant correctly. And what does that mean? You don't sing chant like you are singing an aria. You don't use your chest, or as the science-types are wont to say- AT action. It's not full voice singing. Singing chant is a CT driven activity. That said, chant isn't sung in falsetto. It is a rich, dense sound, one that carries very well. Is this easy to do for the untrained singer or monk? Of course not. Tradition has it that a novice would spend a year or two just sitting in the choir before beginning to sing. And why would that be, do you suppose? I believe this is because it took time for the sound of chant- a language all its own- to worm its way in the novice's brain. Again: chant singing involves singing with a dense, rich tone. One that can grow into full voice if you know what you are doing. And this is the point of this post: you have to know how to sing messa di voce before you really know what singing in head voice means. Bel canto singing thrives on this dense, rich tone. It was a real thrill to stand where monks stood and sing chant in spaces that were created for just this purpose. Thank you for your comment skydiving. You describe my feeling exactly.